A few weeks back on Something for the Weekend, Simon Rimmer made delicious looking Smoked Cheese and Leek Pies. 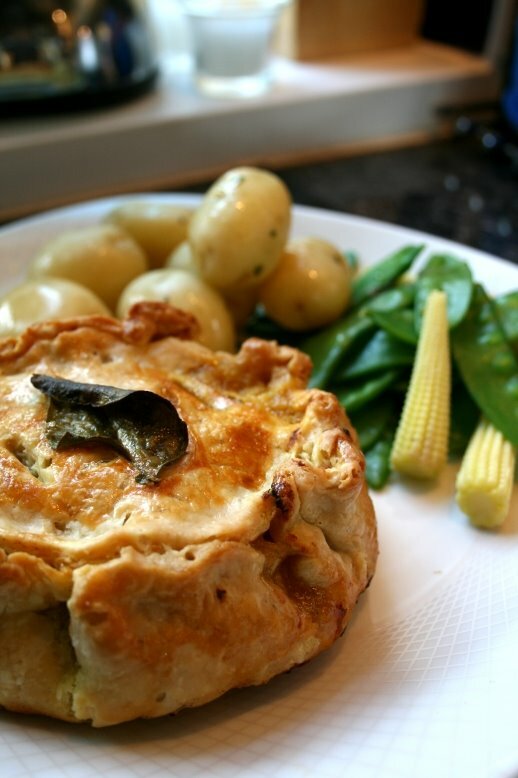 This inspired me to get over my savory pastry fear and have a go at making my own individual pies without doing a Delia and resorting to ready-made pastry. The fact I’m on Easter Hols has injected me with a bit of confidence and time to try new things. By using the Simon Rimmer pastry recipe Simon Rimmer and making a Thai curry filling using the left over chicken from Sunday, I present my Thai Pies! The original intention was for the filling to be Thai Green Curry, but Hubby picked up Yellow Curry paste by mistake. This paste worked well as it produced a thicker curry, perfect for the pie. I was really pleased as to how the pastry worked out. It wasn’t heavy and contained the filling well. I’ll certainly be making the pies again, with different fillings. I did take photos of the pie open, but it looked like I had dropped the pie and it had exploded! Makes 2 individual pies with a bit of leftover pastry. 1) For the pastry rub together the flour, suet, butter and salt. Add a splash of water to help bring the dough together. Form into a ball. Place ball back in the bowl, cover in clingfilm and place in the fridge for 30 min. 2) While the pastry is chilling start on the curry. Heat oil, paste and sugar on a high heat for about a minute. Reduce heat then add chicken and leaves until coated in the paste. Add coconut milk, fish sauce and simmer for 20 min. 3) Stir in lime juice, mange tout, sweetcorn and coriander. Remove kaffir lime leaves (optional). Allow to cool. 4) Preheat oven to 200oc. Line baking tray with parchment. Roll out pastry until about 5mm thick. Cut 2 circles 15cm in diameter (about side-plate size) and 2 circles 8 cm in diameter. 5) To make the pies, place about half of the filling mixture in the middle of one of the larger circles (you may have some curry left). Place one of the smaller circles on top of the mixture, then bring the sides up and pinch around the top to help it stand. Place on the baking tray. 5) Brush pies with beaten egg, place kaffir leaf on the top of each pie. Bake for 20 min until golden.